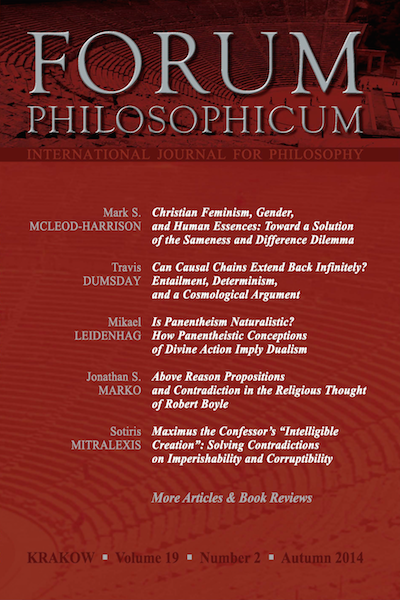 In the Autumn 2014 issue of Forum Philosophicum, we bring our readers five studies on a range of issues related to Christian philosophy and the philosophy of religion. Mark S. McLeod-Harrison sketches a proposal for a Christian philosophy of gender. Travis Dumsday proposes a new argument against causal chains regressing to infinity, which, he hopes, can address the objections historically raised against these kinds of arguments, used as foundation for various theistic stances. Mikael Leidenhag points to problems in panentheistic ontology, due to which it cannot be offered as a naturalistic account of Divine action. Jonathan S. Marko, in his analysis of propositions that are “above reason” in Robert Boyle, challenges Jan W. Wojcik’s claim that Boyle thought accepting religious doctrines required us to violate the law of non-contradiction. Sotiris Mitralexis puts forward an account of Maximus the Confessor’s view of intelligible creation that attempts to resolve contradictions in the latter’s statements about the corruptibility and perishability of the intelligible world. Can Causal Chains Extend Back Infinitely?